Anyone who has watched TV or an Apple or Google keynote event within the past year knows that paying for things with anything but your credit card is all the rage. Visa, not to be left out being a leader in all things money, is experimenting with a new device. Meet the Visa payment ring. Set to launch at the 2016 Olympic Games in Rio, Brazil for the firm's 45 athletes repping Team Visa, a prototype of the device was shown off at an event in New York City. You've seen something – seemingly thinner and lighter, at that – like this before in the Kerv ring earlier this year. However, Visa does have a first to tout with its own payment ring: tokenization. Using its Visa Token service, which replaces the attached card's sensitive payment information with a unique digital identifier, the ring can be used to process payments without exposing any account details in the transaction. And, the process is stupid easy. When an NFC-ready payment terminal is prepared to accept a card, just make a fist and gently "fist bump" the terminal. Your payment is accepted automatically from there, as if you had just swiped your card. However, save for a secure microchip made by Gemalto and a tiny, NFC-enabled antenna, there's nothing else inside this waterproof ring (to a depth of 50 meters) designed by McLear & Co. That means there's no need to charge this device, as any payment terminal picks up the hard work once it reads Visa's unique token from the ring's otherwise dormant microchip. All said, there are two catches when it comes to Visa's payment ring. First, it's a tied to a prepaid, contactless debit card (seen above) supplied by Visa. Athletes will have to load up their card – err, ring – with cash via an online portal before gently punching the nearest point of sale. Second is that I was told several times by several Visa representatives that this is very much a test for Visa. (I was also told that the ring will be shaved down a bit before the big event.) Should things go well down in Rio, the firm will consider a wider release of the device. 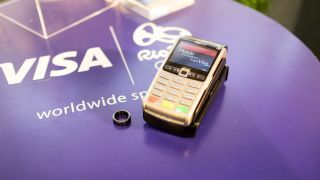 Once the ring gets the Olympian seal of approval, perhaps we'll see an official Visa Payment Ring tied straight to our debit cards. Honestly, I just want an excuse to coin the term "Punch Payments."